One major difference between living organisms and manmade products is that living organisms respond and adapt to their surroundings. 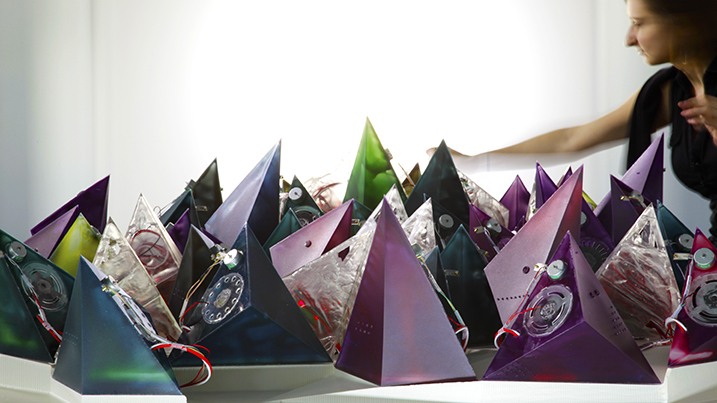 A team of students at CAAD in Zurich recently produced ‘Resinance,’ an installation consisting of more than 40 dynamic triangular objects that respond to human touch. “In its assembly it represented an ecology of functional units that could both work autonomously but also in coordination with their neighboring units,” explains the CAAD blog. Visitors are invited to touch the objects, and the more times one of the objects is touched, the brighter it will shine. But that isn’t all — each object is connected to three others, and touching one object affects those around it. The aim of the Resinance project is to experiment with smarter materials that could be used in an architectural context. One major difference between living organisms and manmade products is that living organisms respond and adapt to their surroundings. A team of students at CAAD in Zurich recently produced 'Resinance,' an installation consisting of more than 40 dynamic triangular objects that respond to human touch. "In its assembly it represented an ecology of functional units that could both work autonomously but also in coordination with their neighboring units," explains the CAAD blog. Visitors are invited to touch the objects, and the more times one of the objects is touched, the brighter it will shine. But that isn't all -- each object is connected to three others, and touching one object affects those around it. The aim of the Resinance project is to experiment with smarter materials that could be used in an architectural context.